On the 1st of September spring arrives here with a rush every year. It's like a starting signal for rising temperatures and very quickly the temperature can get to the late 20s (C). It's not unusual for some deciduous species to start shooting new leaves in August. Some have even held their leaves over winter. For my deciduous trees that need root pruning I like to do them now. 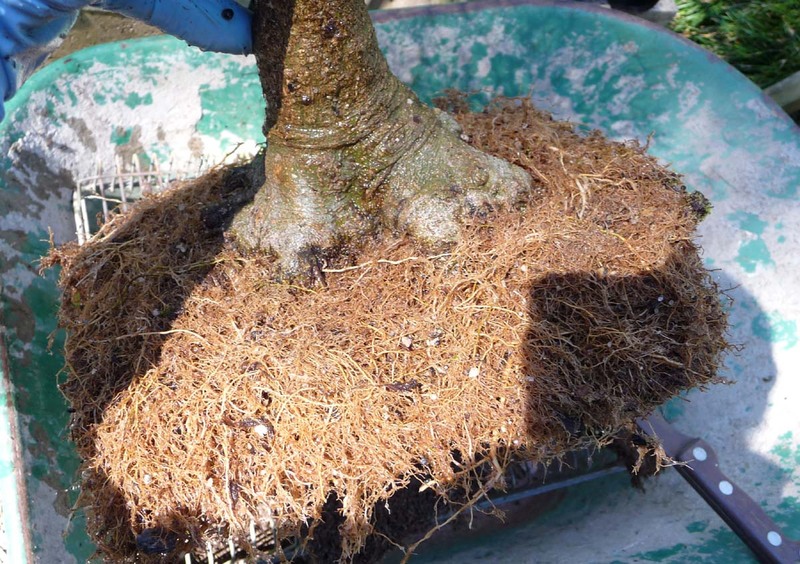 Last year work got totally in the way and so by this year most of the trees have been in the same pots undisturbed for 3 years, well overdue for a trim under the water line. I've got some work ahead of me and the pot making is relegated to the back burner for now. I thought a little series of shots of the process might be fun. 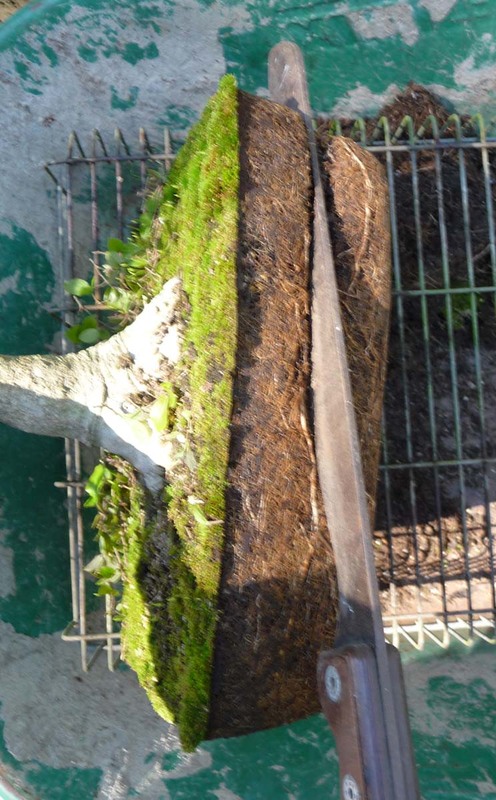 This tree is a Celtis Sinensis or Chinese Hackberry. 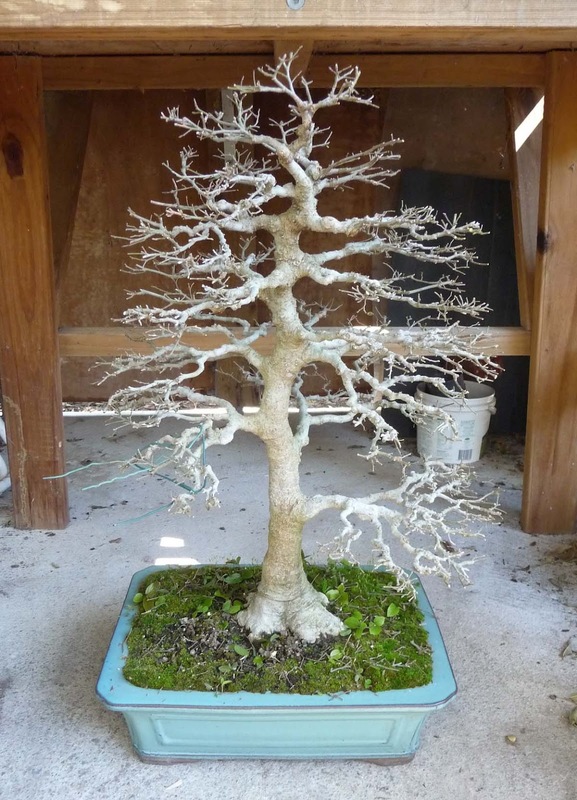 Looked down on by some but they are eminently trainable and make beautiful bonsai. It's over 25 year old. 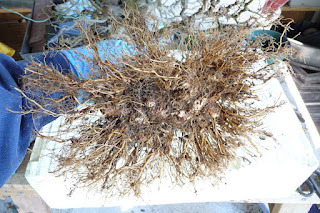 To start here it is before root pruning. 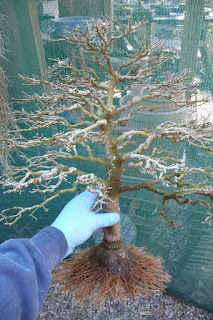 At this point I've pruned the branches, The wires on the lower left branch are there to remind me where I want to develop a little more branch mass as it fills out with new foliage. The pot is a pretty chunky glazed chinese pot. Not a bad choice but the tree would be better suited to a more shallow pot - one of mine! 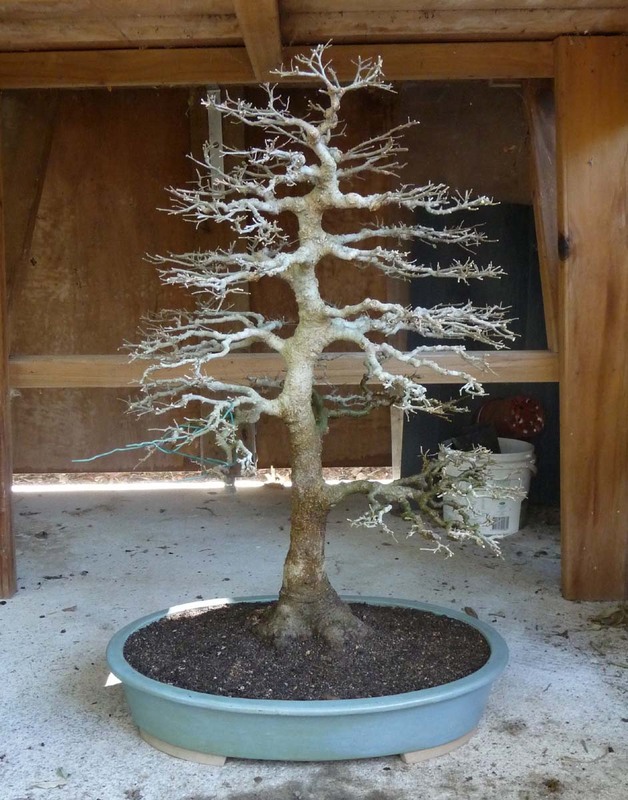 The tree has a well developed nebari, and good taper the result of yearly root pruning in its youth and gradual development of height. 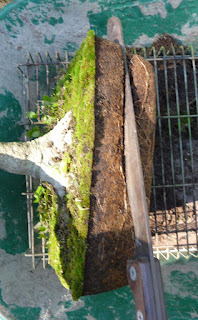 I start with root pruning tool number 1, the machete. 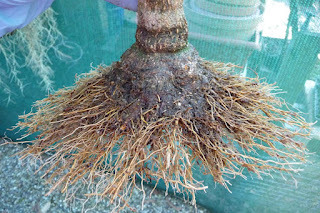 If you are confident about having a good root mass of fine roots then this is a good quick way to halve the root mass. Not to be used with a young tree or one where there is the chance of a few dominant long roots. First off comes the base. Then around all four sides. 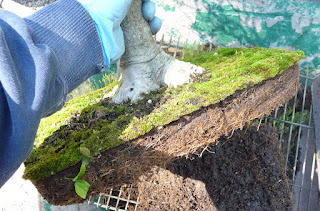 The base and edges tend to accumulate a greater root mass so this gets it off fast. 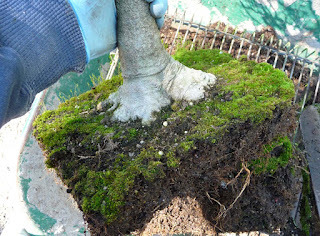 Then a good water jetting to remove the soil. 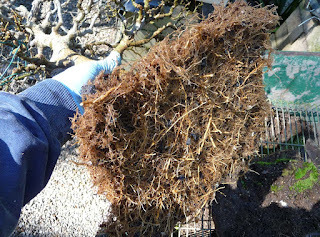 Looking at the photo above you might think there wasn't much root activity left in the soil still attached to the plant, but give it a wash and you can see just how much there is - a tightly woven mass. Next comes the further thinning, firstly getting right back to the underside of the trunk and then creating a good radial disc of roots to service the tree and further develop the nebari and taper. 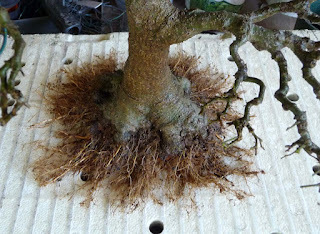 Here you can see the underside of the trunk and how the roots principally come from the outer edge of the nebari. For the uninitiated this looks like certain death, but in reality the tree manages well and in a few weeks will be in full leaf. The process is not much different from what is done with bare root sold roses or fruit trees. 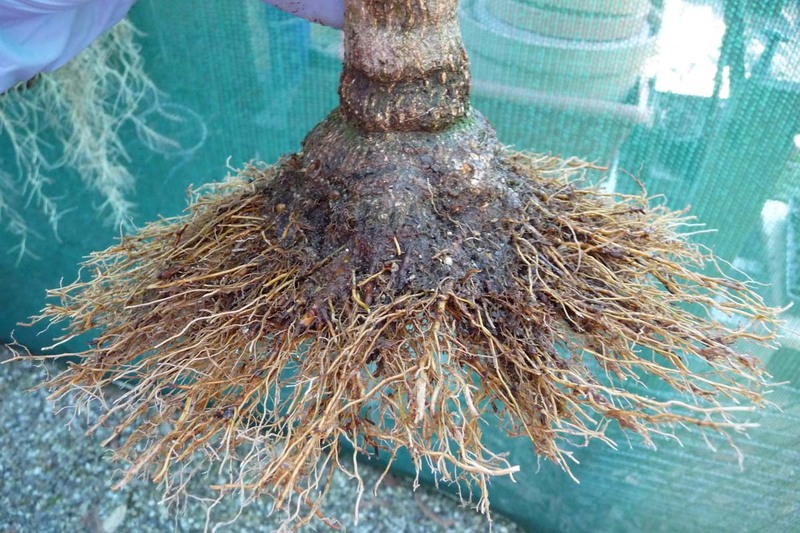 The advantage here is that over previous years primary roots have been eliminated in favour of a good distribution of minor and feeder roots close to the trunk. And finally re-established in it's pot. The pot is one of mine - number 19 from Post 27. Not exactly a studio photo but you get the impression. 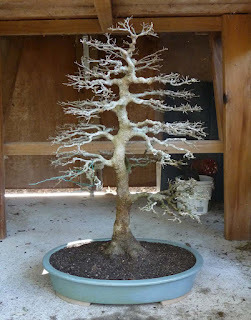 Both the tree and the pot look so much better together. Here's another one to show again the radial disc fine root development for a fast recovery from pruning and ongoing nebari development.